"Financial Muscle for Fitness Pros"
As a professional financial planner and also a NASM certified personal trainer, I see so many similarities between maintaining physical health and achieving financial fitness. Combining my two main passions, I wanted to provide a platform to fitness professionals who are committed to getting mastery over their money and building financial muscle. Getting your finances in to peak condition can be a tall order. It is not the most exciting topic for people, and it can be frustrating to try to make sense of all the details that go into successful financial plans. Professionals like you are focused on building a career, serving others, and trying to maintain a good work/life balance. The good news is that building financial muscle is built on the exact same qualities that you use every day to help others achieve peak physical fitness. 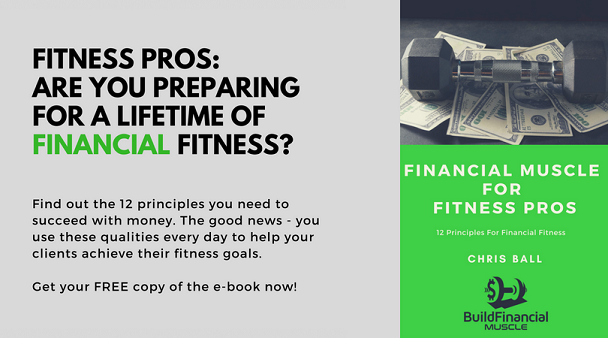 Get your free copy of my e-book "Financial Muscle For Fitness Pros" right now! This workbook contains 12 principles that I consider the foundation of lifelong financial success. Give these principles careful consideration and apply them in your situation. You’ll be amazed at the results. Let’s get started – it is time to build financial muscle! Fill out the form below and you will receive your free copy of my book "Financial Muscle for Fitness Professionals" now! © Copyright 2019 Build Financial Muscle. All rights reserved.